Come join the More Than A Bakery family! We are growing! More Than A Bakery is not just a facility, it’s a new way of thinking about work. We’re building a community, where our work gives back to our families, friends, and neighbors. Life needs balance, and we’re striving to ensure that everyone at More Than A Bakery not only cares about their careers, they enjoy them. That means that we provide opportunities for growth, benefits for stability, and community outreach to show just how much we care. Visit www.morethanabakery.com for more information. Before we get into the nitty-gritty of tonight’s matchup with Texas A&M, there was a National Championship last night that had everything you want in a football game, except a thrilling finish. Pick Six’s, fourth down conversions, one-handed catches, two missed PATs and an ELECTRIC halftime show. We also got a Mac Jones sighting, one that would prove to be fatal for the Crimson Tide. And just like that, Trevor Lawrence turned Nick Saban into a mortal with a 44-16 CFB Playoff National Championship victory. What an incredible performance. Alabama did not win, but at least they’re still Champions of Life. There are a few silver linings from Kentucky’s loss at Alabama. First, the loss did not reveal any long-term structural problems with this Kentucky team. Second, the loss will not marinate for long. Tonight the Cats get a chance to wash their hands clean of the the setback at Alabama by whopping up on the Texas A&M Aggies. Without Tyler Davis and Robert Williams, Billy Kennedy’s squad has struggled. A&M has the worst record in the SEC at 6-6. Two of those losses were to Valpo and UC-Irvine. They will enter Rupp Arena after coming up short in a two-point loss to Arkansas. A&M is led by TJ Starks, a 6’2″ point guard averaging a team-high 14.2 points and 4.1 assists per game. The Aggies also have a pair of lengthy wings that could pose a problem, but this game is all about Kentucky. After two games of team basketball, the Cats reverted at Alabama. That’s right, you can watch the Cats take on Texas A&M tonight at Rupp Arena for only $15. To purchase unclaimed 200-level student tickets, use the promo code “GOCATS” at Ticketmaster. Despite the loss to Alabama, Vegas is not confident in the Aggies. Kentucky opened as 12.5-point favorites over Texas A&M with an over/under around 150. Before the Kentucky takes the court, listen to the KSR crew preview the matchup between the Cats and A&M. All of the action begins on 630 WLAP or online at 4:30 pm. Tom Hart and Jon Sundvold will be on the call for the SEC Network beginning at 7:00 pm. If you’re stuck on the road and can’t watch, there are multiple ways to listen to The Voice of the Wildcats. Instead of assigning New Year’s resolutions, John Calipari asked each of his players to pick a word “that best describes what you’re trying to accomplish, what your strengths and passions are, and something you need to work on.” Calipari’s word is build, Immanuel Quickley’s is feel and Tyler Herro’s is simply win. You probably already picked a resolution, and cheated. Instead of “lose 15 pounds,” I’m going to take Cal’s advice and choose the word flexibility. Yoga SZN is in session. What’s your word? The KSBar Hammer Bowl Challenge was a smash hit. 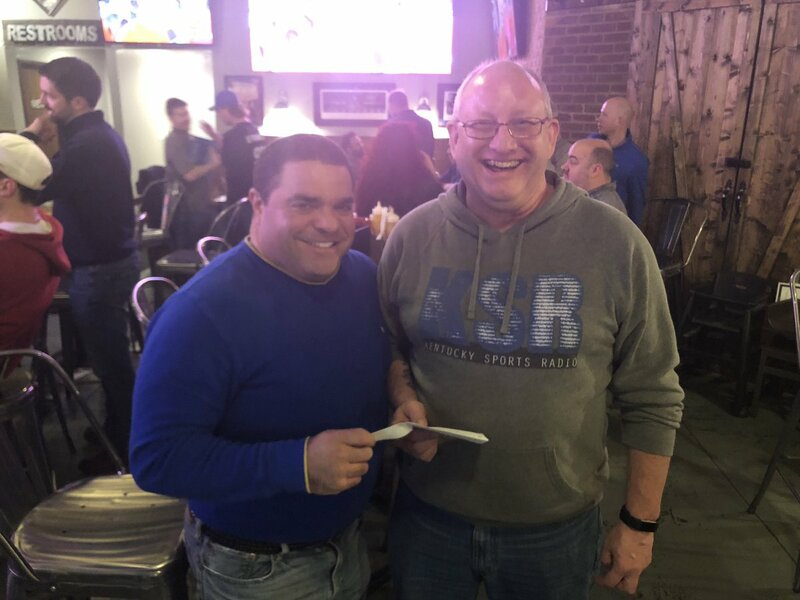 After a month of bowl predictions, last night The Hammer was in the building to give $5,000 to the winner, Mike Pinson. Congrats! How many 4th down stuffs did Bama have? That was amazing!! Shut out in the 2nd half, wow. Embarrassing. That whole game was jaw dropping. Clemson is set to be the dominant team for a few years now. And Alabama was really bad, but they weren’t as bad as the halftime show.